The front step of the apartment where we are staying has a hollow on the right hand side. It is the door on this side that always opens. People have been treading on that step since the 16th century; their footsteps have worn a smooth groove in the stone. Once you enter this beautifully proportioned building, the stairs to the first floor are similarly worn, as are the tiles on the landing. To walk on these smooth hollowed surfaces is a pleasure: somehow they help feet find their place, become part of a history of a place. 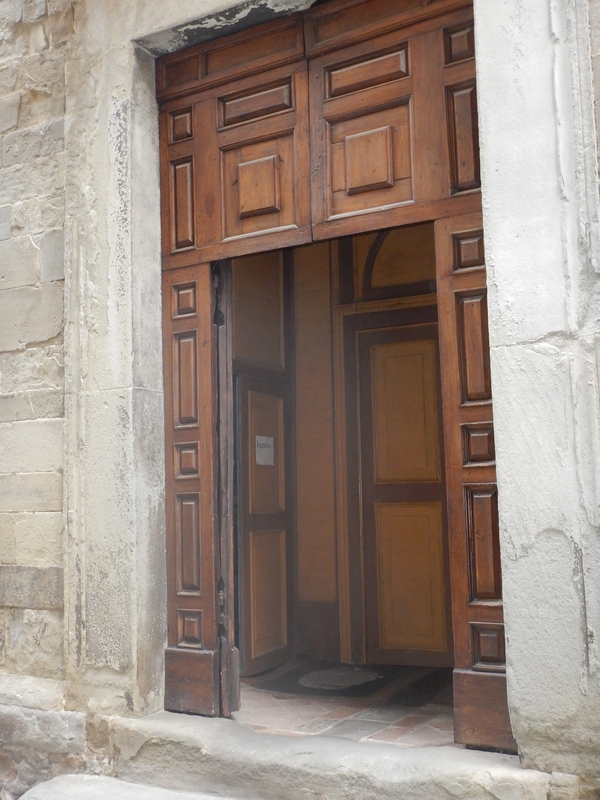 All along this renaissance street, and in every building, palazzo, church in the centro storico part of this town, doorways have these hollowed steps. Wonderfully, physically, they bring you in touch with the generations long before and after us who have walked, will walk, here. 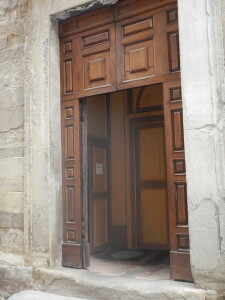 I have been fascinated by Italian doors for a long time. In the places that I have been – central Rome, Florence, for example, and here in Anghiari – they are quite simply beautiful. They make you pause; you want to take in the detail: the texture of the wood, the figure on the knocker and so on. 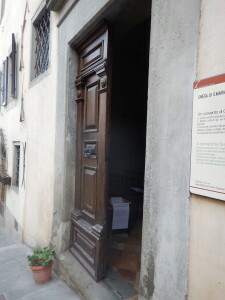 But, the other thing about them is the sense of mystery they invite: what does this door open to? For, in these places, there is no way of knowing, when the door is closed, what lies behind it. Partly, this is because of the architecture: all of the buildings along the road where we are staying, for example, are renaissance. Likewise, in Florence, in central Rome, on any street, buildings are likely to be of the same era – renaissance, baroque… (Perhaps it would be more correct to say that they have the same historical layering.) 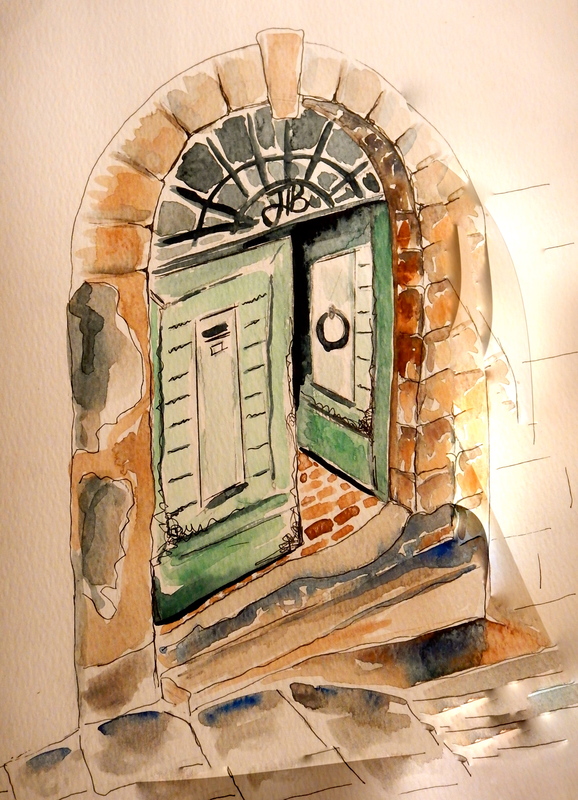 But, the surprises offered by these doors are not simply a result of architecture: it is the way in which architecture comes together with community life that makes them so inviting. What they open to is not predictably homogeneous because, in these places, one finds a whole range of everyday life activities within a short distance from each other. Here, on Corso Matteotti, behind these doors there are, for example: a real estate office, a church, two restaurants, a newsagent, a joiner’s workshop, the shop that sells everything, a tobacconist, the post office, an optometrist, and many residences. As I walk down the street, through a half-open door, I might glimpse a courtyard, a presepio, a store of bags of cement, an umbrella stand. At siesta time, a locality like this can feel like a ghost town: all shutters and doors and closed; everything is very quiet. 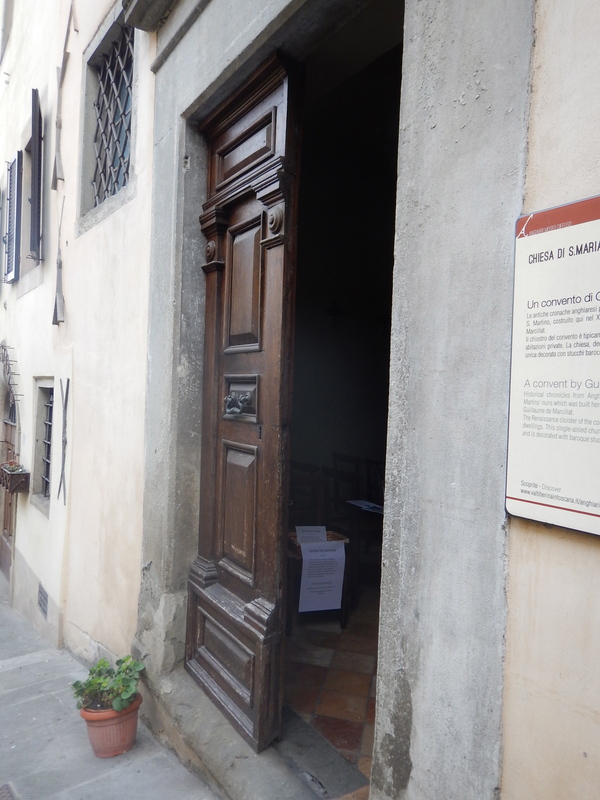 Then, miraculously, at passiaggata time, doors open, people appear, shops appear. The town comes to life. Sadly, tomorrow we will be leaving through our lovely green door, on our way home to Sydney. Ann, with thanks to Yvonne Mears for the painting of our door. PS we have just had our final meal at the hospitable restaurant of my last post. Talking to our hostess about doors, she said ‘they are alive’. She’d got it. It’s been a pleasure reading them, Ann. I will miss them.